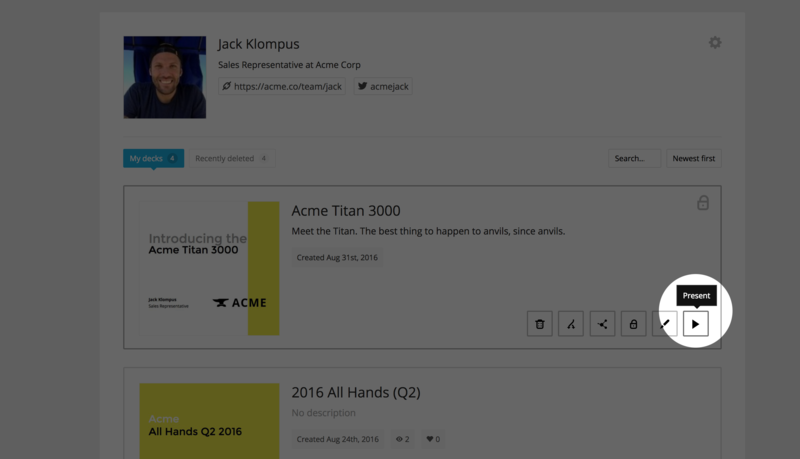 To present a deck on Slides start by clicking the "present" button on your profile page (pictured below). The present view can also be opened by append "live" to the end of your deck URL like so slid.es/<username>/<deckname>/live. The present view offers a few different options for setting up your presentation. For example you can go full screen and show or hide the presentation controls. Once you're ready, press the "Start Presentation" button to hide the controls. The present view is used in parallel with the speaker view. The present view is what you should show the audience whereas the speaker view should only be visible to yourself. When you navigate either of these two views the other will automatically update to show the same slide, meaning they are remote controls for each other. 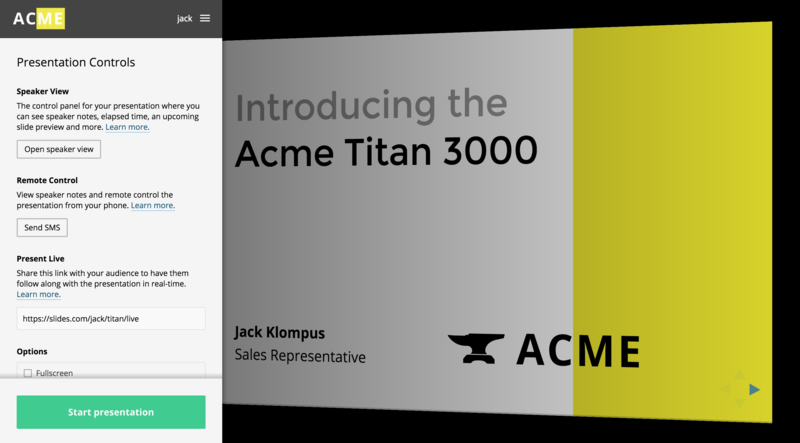 You can let your audience follow along with your presentation in real-time from their own browser. Just send them a link to the present view and they will be kept in sync as you present the deck. This shareable link is also visible in the presentation controls, see the screenshot above. One additional feature of the Slides presentation toolkit is remote controlling from a touch-enabled mobile devices. Meaning you can use a phone to remotely control your presentation on stage through simple swipe gestures. The remote control view also shows your speaker notes as well as how many live subscribers you have.